For pre-booked groups of 20+ paying visitors, we have facilities at Roves Farm to cater for a variety of groups, large or small, children or adults, from preschools to WIs! For information about specific requirements please contact us. Heated in Winter! 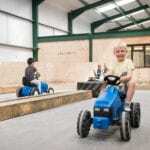 For all ages, including tunnels, slide, swings, soft play and pedal tractors. Socks must be worn. 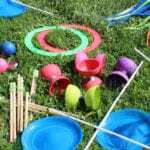 Explore the willows and have a go at building a den in our den-building zone. Or take a walk past the Animal Paddocks – why not pick up an Explorer’s activity sheet before you go? Succulent and tasty Roves Farm reared lamb, pork and beef, as well as delicious home-baked cakes and savoury items. Plus lots of local produce and a range of gluten-free merchandise too. To check availability and to ask any questions about our group visits, please contact us using the ‘Check Visit Date Availability’ button top right or phone us on 01793 763939. Once we have confirmed availability please submit your booking via the ‘Make a Booking’ button below. Please provide as much information as you can about any particular aspects of the farm which the group will want to see or talk about, and the attitudes on either religious or moral grounds of anything that might cause embarrassment to any member of the group. A non-refundable deposit of 20% of the estimated visit cost (subject to a minimum of £50) is required to secure your booking.